Another giant has left to receive his well earned rewards! Well done Dr. Patterson!! My great grand parents (John Henry and Virgie Montgomery) were members at Mt. Corinth until their deaths. We we raised going to Houston every summer for Mt. Corinth Vacation Bible school and my great grandparents spoke VERY highly of Pastor Patterson. I was ALWAYS intrigued by his philosophical approach to preaching and learned a great deal from him. I’m deeply sadden to hear of his passing, he will truly be missed by all. Rev. Dr. A. Louis Patterson will be forever missed from this place. He is now absent from the body present with The Lord. I shall never forget his great preaching and teaching down through the years. I ask right now in the names of Jesus God’s covering over the Patterson family that He will supply their ever need in this season. Rest on my friend and one of these mornings that the Apostle Paul spoken about where the saint will all gather in the middle of the air we shall all meet again. I wish even more now that Heaven had a Facebook because so many of you whom I love so dearly are daily transitioning home daily. He was profound, poetic, prolific and empowered by the Holy Spirit. As a young girl, I would visit the church near Finnegan Park, in Fifth Ward. I was amazed at his ability to capture the attention and interest of listeners. May God bless his family, friends and colleagues. The genius and the gift will be missed. He was a great contribution to the body of Christ, He’s going to be greatly missed rip. WOW! I am so very sorry to hear this news! It is our loss, but heaven’s gain… “for precious in the sight of the Lord is the death of His saints.” Psalm 116:15 What a great powerful man of God. I just listen to a sermon he preached on youtube http://www.youtube.com/watch?v=1DPilFnHSOs‎ what an awesome preacher. My family grew up together as children with Dr. Patterson and his family many many years ago in the small town of Granger, Texas. May God Himself comfort the Patterson family, loved ones, friends and church members with His powerful love, peace and grace during this time of their loss, only three years after the loss of his son. My heart is sadden, yet rejoices that he is in the presence of the Lord. My life was recycled through his ministry and I rejoice that he is finally in the presence of the one he loves so dearly.Jesus Christ The Lord. Hello my name is Nasia Ford you may not remember me but I use to got to church with you as a child and you were a great person in my life. I hope all is well and i thanks you for all you’ve done for my family your god baby Nasia! Servant of God Well Done, Rest from thy love employ. The battle has been fought and the victory has been won, Enter into thy masters’ joy. A great teacher, preacher, pastor, pioneer, and soldier was He. May God comfort you (The Patterson Family) and know that God is still in charge and that this Saint didn’t die, He just slept away. I was only privileged to hear Dr. A.L. Patterson one time; I went to the NBC in Kansas City, KS. At the behest of my then Pastor, Dr. Felix George Williams, III, I went to hear Dr. Patterson and that experience would forever change my exegetical and hermeneutic outlook. Not only was he an excellent expository preacher, but he also had the ability to wed the synthesis, antithesis together in one harmonious balance. I appreciate that experience even today. Thank you Dr. Patterson for teaching this nappy headed preacher from Kentucky, how to untie biblical truths with our existential pilgrimage. Take your rest, God will be pleased with your efforts. I would like to say that there is only one Pastor A.L. Patterson. I was raised up from a young child leaning on my grandmother’s shoulder Sister Ruth Anna Warfield who went home to be with the Lord April 1997. I remember nothing but great times at Mt.Corinth from vacation bible school, to “my my my”. 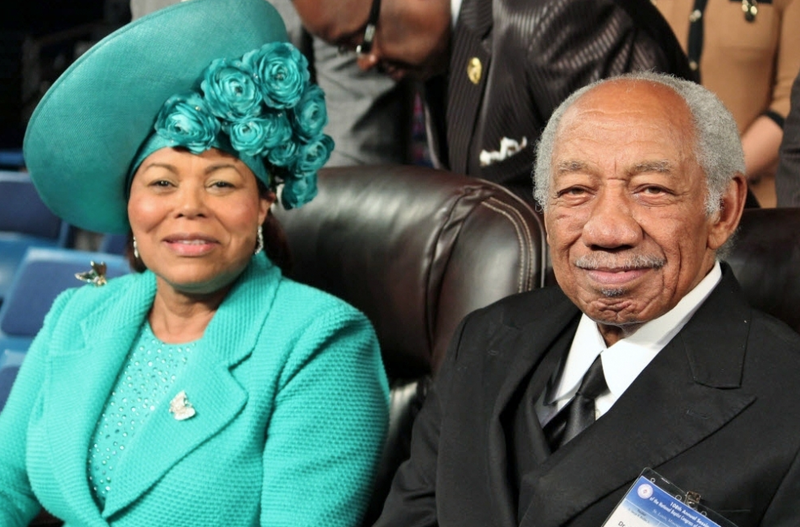 Pastor Patterson stated”that my grandmother was the only member to ever beat him to the church. All of her grandchildren would be out on the church lawn picking up paper until the doors of the church was unlocked. THE ONE THING THAT SHE TAUGHT ME WAS TO REMAIN FAITHFUL IN GOD’S WORD. Her house caught on fire while we were at church and she asked, if the rest of her grandchildren was safe? Everyone was safe and she went back in the church to hear the word of Pastor Patterson. It hurts me that I wasn’t able to learn more from him as l went off to the military. However! Everytime I was home, the phone rung at 6am so that I could drive her to church, to here the Dr. A.Louis Patterson. I know she is standing with open arms welcoming him home. A job well done, by a well and humble faithful servant. In the genius of Almighty God, there was in our midst a real divine messenger. One who when he finished his message left us with the precious, powerful, penetrating and presence of Our Creator. For this we humbly thank God. May we continue to strive to please Our Father in our calling and the memory of your Servant/Leader The Reverend A.L. Patterson. In the genius of Almighty God, there was in our midst a real divine messenger. One who when he finished his message left us with the precious, powerful, penetrating presence of Our Creator. For this we humbly thank God. May we continue to strive to please Our Father in our calling and the memory of your Servant/Leader The Reverend A.L. Patterson. As a young “whooperless” preacher. 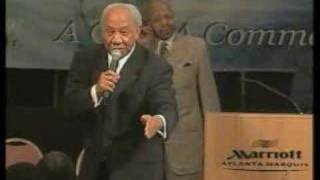 I first heard this great preacher in 1984 at a National Baptist Congress. I was stunned and felt I had a place in black baptistdom. I shall remain forever grateful to the Lord for the ministry this giant was a steward of. “Oh Holy Ghost just hold my mind just a little bit longer”…. The calling of Dr. A. Louis Paterson from labor to reward is the end of a golden era. Men like him can not be forgotten. They were used to impact a new generation of leaders. Indeed, he was the tallest of pulpit timber. His passing leaves a lonely place against the sky. Pastor a Louis Patterson will be well missed he was more than a pastor he was a reachable touchable pastor he was family and his wife and children very special Pastor.PASTOR A LOIUS PATTERSON JR..MOUNT CORINTH WILL NEVER BE THE SAME..
My first trip to Houston was with my church McCoy M.B.C. Dr. R.A. Williams Jr. We did a church trip to Houston to fellowship with Dr. Patterson and his congregation. Dr. Patterson and his wife took all of us to dinner, he he drivers to take us around the city. They showed us great hospitality! The next day was Sunday, let me tell you, we had such an awesome time at Mt. Corinth! Such a loving church. I will miss Dr. Patterson, so many of us learned so much from him,you can just watch him and learn from him. He was a great man of God, gone but never ever forgotten. Amen Great man of God. I visisted Mt.Corinth a many of times with my late mother inlaw Dianne Lynn Isreal and I really enjoyed Dr.Patterson and his belated son Albert Louis Patterson the third. Wow what great men of God they will truly be missed. May God Bless And Comfort His Wife and Children and Grandson. What a joy for kelvin and I to been able to just listen and learn so much from this mighty man of God. He was such an inspiration to us and many, we would go and visit Mt. Corinth early before our service, we were excited about going there to visit every Sunday. Glad to have had that chance, we will miss him in the earth, but thanks for the legacy he left behind. Family be encouraged. Looking forward to seeing him again in glory! What a giant in Gods kingdom. God chose him, God blessed him, God shared him with us for a little while and now God has taken him. To God be the glory. May the grace and peace of God comfort and console the Patterson family and the family of saints who loved and was touched by Dr. A. Louis Patterson. way with Gods’ word.Took you on a prayerful, resonating, revelation walk through the word of God . One idiom he used in revival at the Second Baptist Church Monrovia , California. Chewing on the cub, like a cow chews his food takes it down and regurgitate the food back up.He confirmed to us we are to connect and revive in the word of God. It is difficult to realize that we will be denied the voice of Pastor A.L. Patterson. I was a member of his church, Mt. Corinth MBC Houston, Texas, for over 10 years. Pastor Patterson baptized my son “Frankie” and in October 2009 he attended my mother’s homegoing celebration and spoke at the service. His annual November Revival here in San Diego at Trinty Baptist Church, Rev. Clyde Gaines, was a treat to this community. My condolences to his wife Melba, son Allen, daughter Alette and the members and friends of Mt. Corinth MBC . May he rest from his labor. rev. When I came to the National Baptist Convention in 1988 I was a young Pastor/preacher looking for a national mentor! There were several great men on the stage; E. V. Hill, J. C. Wade, Jr., Cullum Hill, Emaunuel Scott, and C. A. W. Clark, just to name a few! My lot, my spirit, my heart locked onto the Reverend Doctor A. L. Patterson for several reasons! 1. He was the Master of Alliteration! 2. He was the Master of Expository! 3. He was the Master of scripture and verse and book memory! 4. He was, from where I was sitting, hooping challenged! That challenge changed my perspective on preaching, research, sermon development and delivery! I would dare say that Dr. Patterson’s example, salvaged, strengthened, and in many ways solidified my own preaching style! I can only hope that as others observe what I do they can find some of the same hope and help in me as I found in Dr. Patterson! My prayers go out to his lovely wife, his children and his church family! Rev. Dr. A. Louis Patterson Jr., Pastor of Mount Corinth Missionary Baptist Church in Houston for over 42 years, as our guest for the E.K. Bailey Memorial Preaching Celebration. The title of his sermon is: “Remember the Lord’s Teaching” and is drawn from Deuteronomy 8:1-5. Dr. P. Andolph Hamilton, Mississippi. Dr. Patterson changed my ministry and my preaching. I learned how to study, prepare, and outline my message through the deligent sermonic presentations of Dr. Patterson. I am grateful that in 2013 at the Frank Ray Conference I had an opportunity to sit down with him once again and let him know how much I (we) appreciate him ministry. he was a gift from God to Preachers and Pastors across the nation and world. Payers for the family an a never ending lone for OUR Pastor, DR. A. LEWIS PAATERSON JR. Rest In Peace! Pastor Patterson touched a body of believers in Rhode Island. We meet at a conference and he would ride with us on the van everyday. Oh what a great fellowship we shared.